Revolutionise your makeup with Ardell's Magnetic Lash Natural Accents 001 False Eyelashes. Eliminating the need for messy adhesive, the innovative, reusable false lashes are embedded with virtually invisible magnets that have been strategically placed end to end for complete magnetic contact. Applying seamlessly to the natural lash line, the top and bottom lashes lock together for a budge-proof fit. Accents can be used on outer corners for the perfect emphasis. Made from 100% human hair, the lashes lend eyes a soft and natural look. Take a matching pair of lashes, remove the top strip and place it just over your eyelashes near the outer corner of your eye. 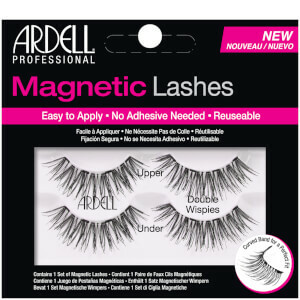 Get the top lash strip as close to your lash line as possible. Take the bottom lash strip and place it just underneath the top lash strip. The magnets will click into place and lock the lashes together.